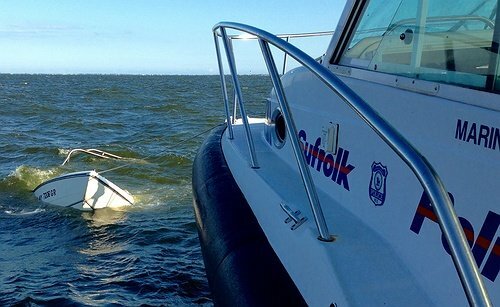 Great South Bay, NY - August 9, 2015 - Four good Samaritans from West Islip, along with police officers from the Suffolk County Police Department Marine Bureau, rescued a family of five after the boat the victims were traveling in sank in the Great South Bay this afternoon. Juan Contreras, 33, of Bellport, was operating his 18 foot Sting Ray in the Great South Bay, ¼ mile south of Gardiner County Park in Bay Shore, when the engine stalled and the boat began taking on water through the engine compartment at approximately 5:30 p.m. The Sting Ray was nearly fully submerged underwater within a short time frame. Contreras and his family members, Maria Contreras, 69, Christine Contreras, 11, Angeline Contreras, 7, and Guadalupe Contreras, 47, held on to the partially submerged hull. William Deak, 46, of West Islip, spotted the victims as he headed toward Bay Shore Marina with his two sons, Jason Deak, 21, Justin Deak, 18, and their friend Michael Laduca, 24, also of West Islip. William called 911 and Jason and Michael jumped into the bay to help the victims. Justin, Jason and Michael are volunteers with the West Islip Fire Department, where Jason is a member of the SCUBA team. While Justin operated the boat, William helped pull the Contreras family out of the water and onto their boat. Suffolk County Police Marine Bureau officers responded to the 911 call and dispatched three boats: Marine Juliet, Marine Kilo, and Marine Alpha. Police officers from the Aviation Section also responded as well as members of the Bay Shore Fire Department and West Islip Fire Department who responded in fire boats. The victims were transferred from the good Samaritan’s boat and onto Marine Juliet. The victims were then taken to shore at Hecksher State Park in East Islip, where they refused medical attention. The sunken Sting Ray was refloated by Police Officers on Marine Kilo and taken to Marine Bureau headquarters at Timber Point in Great River. Halloween Thrills & Chills, Fall Family Fun, News & More in October 18th's Newsletter! Subject: LongIsland.com - Your Name sent you Article details of "Family of Five Rescued from Sinking Boat in Great South Bay by Four Good Samaritans"